Geometry of Convex Sets begins with basic definitions of the concepts of vector addition and scalar multiplication and then defines the notion of convexity for subsets of n-dimensional space. Many properties of convex sets can be discovered using just the linear structure. However, for more interesting results, it is necessary to introduce the notion of distance in order to discuss open sets, closed sets, bounded sets, and compact sets. The book illustrates the interplay between these linear and topological concepts, which makes the notion of convexity so interesting. Thoroughly class-tested, the book discusses topology and convexity in the context of normed linear spaces, specifically with a norm topology on an n-dimensional space. 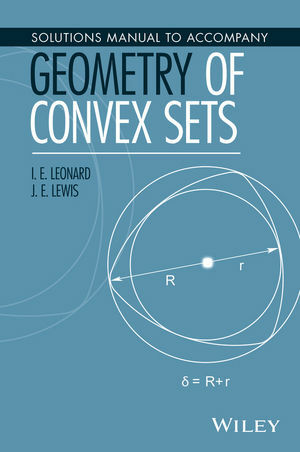 Geometry of Convex Sets is a useful textbook for upper-undergraduate level courses in geometry of convex sets and is essential for graduate-level courses in convex analysis. An excellent reference for academics and readers interested in learning the various applications of convex geometry, the book is also appropriate for teachers who would like to convey a better understanding and appreciation of the field to students. I. E. Leonard, PhD, was a contract lecturer in the Department of Mathematical and Statistical Sciences at the University of Alberta. The author of over 15 peer-reviewed journal articles, he is a technical editor for the Canadian Applied Mathematical Quarterly journal. J. E. Lewis, PhD, is Professor Emeritus in the Department of Mathematical Sciences at the University of Alberta. He was the recipient of the Faculty of Science Award for Excellence in Teaching in 2004 as well as the PIMS Education Prize in 2002. I. E. Leonard, PhD, is Contract Lecturer in the Department of Mathematical and Statistical Sciences at the University of Alberta. The author of over 15 peer reviewed journal articles, he is a technical editor for the Canadian Applied Mathematical Quarterly.